Josefina Odriozola was 14 when the bombs rained down on her hometown. It was market day in Guernica, and she and her mother were selling cabbages. As the German planes released their cargo, devastating the Spanish Basque town and killing hundreds, the two ran home for safety, pulling the family burro behind them. They would spend the rest of the day hiding inside, listening to the explosions. "It was 70 years ago, but I remember every minute," says Odriozola. On this, the 70th anniversary of one of the great atrocities of the twentieth century, Odriozola is not the only one remembering. 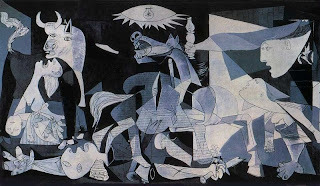 The 1937 bombing of Guernica—among the earliest air attacks on a civilian population, and one carried out by German aviation at Franco's behest—was just one of the events in Spain's bloody civil war and 36-year dictatorship that, for decades, Spaniards didn't really talk about. On a hill not far from the Almudena, Levon has learned that if he lets the ball fall after I throw it to him, it rolls back to my feet. 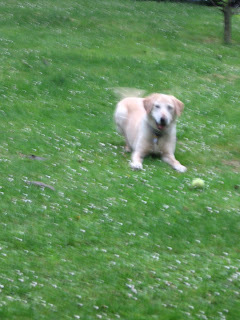 Thereby saving him the trouble of bringing it to me, and evening up the power dynamics in this game of catch we have. Sunday is botellón day in our neighborhood. Botellón: literally "big bottle"; figuratively: hang out in the streets with your friends and drink yourself silly. It must be a sign of my age, but I hate it--the drunken crowds who make it impossible to walk through the square, the ridiculous bongo players, the kids who set up tables to sell junk (okay, buttons and "jewelry") outside our door. So, every Sunday that I'm in Madrid, I call the police to complain. During yesterday's conversation, I said, "This happens every Sunday. Is there anything I can do?" And the cop on the other end said, sighing, "We're trying." 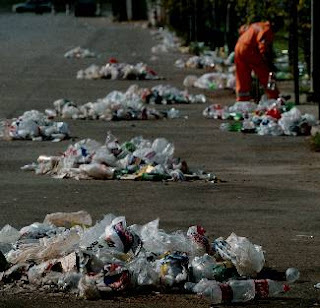 As if, somehow, the fact that thousands of people show up every Sunday to drink in the streets in flagrant disregard for the law, and, not coincidentally, to piss and vomit and leave trash everywhere was beyond their responsibility. But speaking of the trash, if you get up early enough on Monday, you'll see it. Great swaths of rum bottles, and cartons of cheap wine, and crushed plastic liters of soda and the odd lemon slice. Then, the cleaning services come in and make it all disappear. 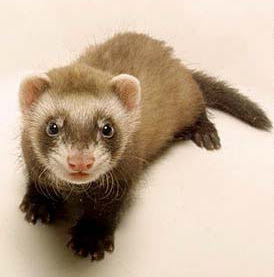 I learned the word for "ferret" this week. I got it by reading a handmade sign taped to a lamppost in the square where Levon likes to do his people-watching. As in: "Lost, hurona, white with black markings. Escaped over the balcony, may be injured." 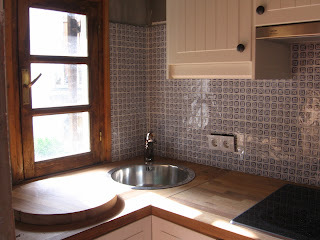 The newly-renovated kitchen of the cabaña, which, lacking only a paint job and some cleaning, will soon be available to rent. Even though I had read good things about Sudestada, I was skeptical. For one, because it is the second incarnation of a restaurant in Buenos Aires, and chains—no matter how small or international—make me nervous. 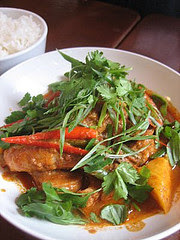 For another, because the menu is all over the place, relatively speaking: Malaysian curry puffs, Singaporean dumplings. Kirin beer. But mostly because when it comes to Asian food (or Mexican, but that’s for another day), I wouldn’t trust a Spanish restaurant critic to know a good pad thai if it stood up and started shooting nam pla-flavored endorphins. Harsh, I know, but born of experience. Though maybe it’s time to review my prejudices. Because Sudestada is great. It’s a small place, which meant we ended up eating at the bar because all of its eight or so tables were booked. And there’s zero décor. But the food is excellent: the Singapore dumplings light and flavorful; the Malaysian curry puff more samosa than anything else, but still delicious; the beef with peanuts glazed with a tangy sauce that had me licking my chopsticks. And for dessert, a dense coconut something—part cake, part pudding—that was achingly sweet, but irresistible. I can’t wait to go back. Even now, Spain is a holy country. Today is Sábado Santo, Saturday of Holy Week. Yesterday was Holy Friday. Tomorrow is Easter, the holiest of the holy days in this holy week. Last Sunday, many Spaniards walked the streets of their cities and towns carrying palms to initiate a week of welcomes for the country’s many saints, penitents, virgins, saviors. Thirty years ago today, Spain gave a different, ambivalent welcome to a long-banished prodigal. 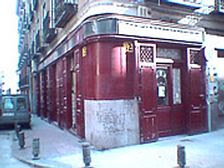 On Sábado Santo in 1977, the Communist Party returned to the Spanish fold, legally recognized after four decades of enforced absence under Franco. Communism’s official return to Spain heralded nothing so grand as eternal salvation, of course, and it surely distressed many Roman Catholics—then, still, the country’s national religion. But this is a place where politics and faith have always had an intimate, if sometimes dangerous, relationship. And so it is perhaps fitting that the day marking the return of the “godless” was quickly christened Sábado Santo Rojo—Red Holy Saturday. Rhetorically, at least, Spain has never been much good at turning away a true believer. As I was saying: Last night the news was filled with pictures of grown men sobbing helplessly, their capirotes clutched to their chest. Because of the rain, their processions couldn't go out. In happier Semana Santa-related news, the town of Corleone (yes, that Corleone) has just allowed its nazarenos to once again wear their capirotes during their processions. It seems that not too long ago, all that face-covering enabled certain, shall we say, rivals, to get close to one another, with the expected violent results. But now, Corleone is ready to show that it has transcended the past. At least its recent past. Because those processions date, after all, to the time when Sicily was part of Spain. Is it my imagination, or do comings and goings happen faster in Madrid than elsewhere? I was walking around Chueca yesterday, and was moderately surprised to find that The Wok, which I'd swear I had eaten at just a couple of months ago, had metamorphasized into Original. No loss there, but still it was a bit of a surprise: white and beige instead of red and black, birch trunks growing from the floor instead of chopsticks on the table, and a menu whose main ingredients come sourced (partridge from Toledo, cheese from Extremadura) instead of invented by some poor Spaniard pretending to understand Asian food. But the biggest shock was to see Taberna Carmencita, the old-fashioned bistro beloved by Lorca (and by me), transformed into an Italian restaurant. And not even Italian: Italo-Argentine. The tiles are still there in their astonishing voluptuousness, but what used to be squid in its ink and braised beef cheeks is now arugula pesto and empanadas. Worse, the exterior is as blue as it was once red. Look closely and you can still see the logo--Taberna Carmencita surrounded by a flowery border--etched in the door's glass. 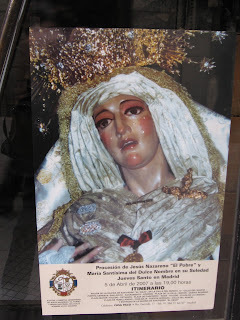 It's Semana Santa, and you know what that means: posters of agonizing Virgins and Christs plastered to every shop window. 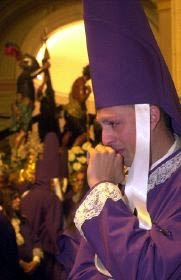 There are a lot of things I've come to appreciate about Semana Santa: the dark, soul-stirring music, the devotion that the men (and women!) who carry the pasos through the crowded night, the solemnity of it all, the 10-day vacation. But the delight and adoration that images of these suffering...can I say it?...statues excites, well, let's just say it's another thing I still don't get.